Kargo Master Van Interior Packages take the guess work out of where to begin uplifting your cargo van. With our strong easily adjustable shelving, partitions and accessories, our van packages have everything you need to put your van to work. This van shelving comes in three widths to meet your needs, including 42 inch, 74 inch, and 84 inch. The units are all welded for durability and stability. Some shelves are themselves welded to the end panels to increase strength and reduce rattling. 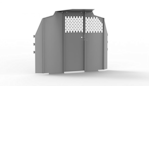 Provides security for the cargo area and protects your valuable tools and parts. Everything to get you started and a great price! Basic Packages Van Partition & Shelving Typically include a partition with wing kit, or bulkhead, and shelving units Starting with just a few shelves and a partition, Kargo Master Base Packages give you a great and economical way to being customizing to your work. The Utility J Hook can be easily installed onto either or both side walls of all Kargo Master Van Shelving units to optimize storage space. Great for holding items such as electrical wires, extension cords and hoses etc. A commercial work van is more than just a mode of transportation. It is also a storage unit, a work shop, and a supply bin. So it is important to maximize space and organize equipment for a well-functioning, highly-efficient work mobile. Contractor’s Solutions provides an array of van equipment options to help you consolidate and manage your workspace. 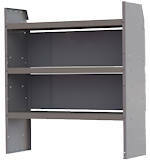 Shelving—All welded shelving units come in three sizes to fit any commercial van, including 42 inch, 74 inch, and 84 inch. They feature traditional shelves as well as cabinet type shelving with doors. They are coated with a hard scratch and chip resistant powder coating, and they are contoured to fit the curved walls of a van. Cabinets—These two, three, and four-drawer cabinets feature heavy-duty ball bearing sliders for quick and easy access. 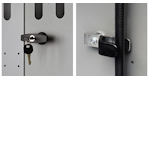 Each drawer has its own latch and catch for increased security. Extra-long cabinet units are also available. Contractor’s Solutions even has a pivot drawer cabinet that does just that—pivots for added convenience. 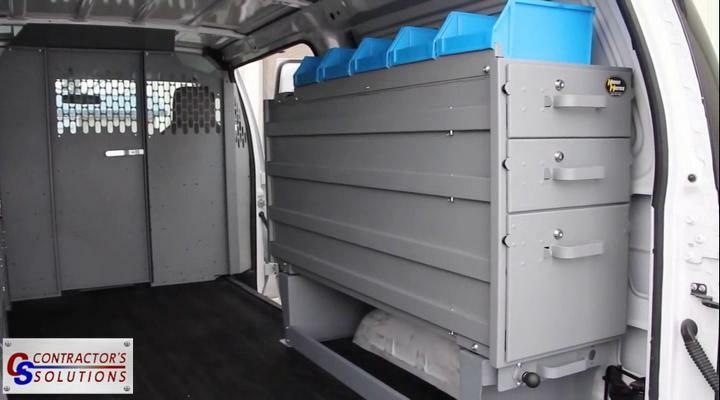 Racks—These refrigerant tank racks can hold three or four tanks, depending on the size you choose. The 14-gauge steel frame features sloped cradles and nylon retention straps to keep the tanks securely in place. These innovative solutions create a safe work environment, especially as you drive from job site to job site. Tool boxes can tip over and open, spilling their contents all over the van floor. Tanks can get knocked over and roll about the back of the van. And loose items can fly about, distracting a driver and possibly causing injury. With the variety of van equipment offered by Contractor’s Solutions, you can roll out in safety.